This post is part of our 10-Year Vision Spotlight series, breaking down the nitty gritty of what’s planned in Phase Two of the Mayors’ Council’s 10-Year Vision! Phase Two of the Mayors’ Council 10-Year Vision continues to bring more transit and transportation improvements to our region. It will not only improve mobility for residents, but also make progress towards the broader social, economic, and environmental goals of our region’s long-term strategies. In this post, we’re breaking down all of the improvements coming to the Northeast Sector, Maple Ridge and Pitt Meadows as part of Phase Two of the 10-Year Vision which we’re seeking public input on until May 11! In March, we announced how we’re preparing to roll out four new B-Line bus routes by the end of 2019! 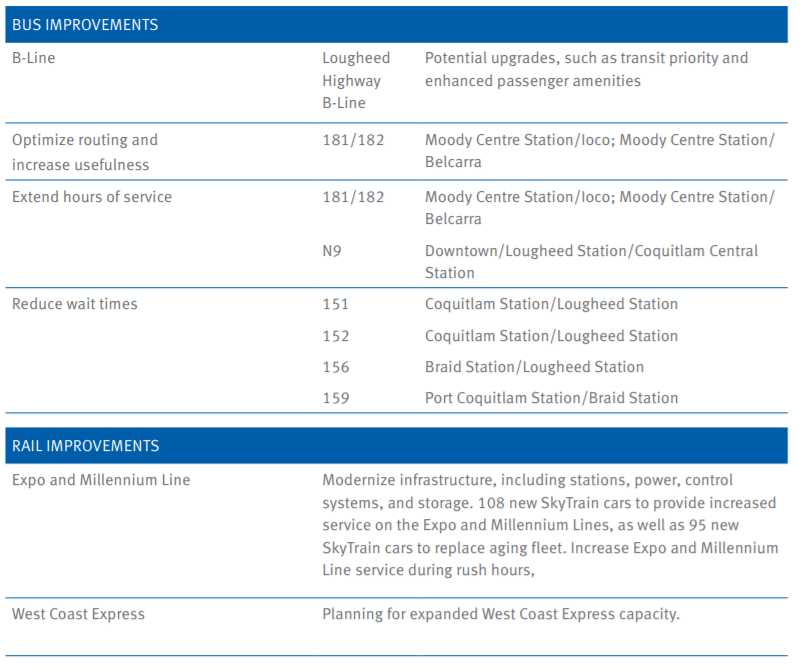 This is great news for the Northeast Sector as the proposed Lougheed Highway B-Line will run from Coquitlam Central Station to Haney Place. Extended hours of service and reduced wait times are also to come with Phase Two of the Mayors’ Council 10-Year Vision. On the rail side, you may have heard, 80 new SkyTrain cars will be available for service in Metro Vancouver by 2020 (28 of which are arriving early!). for the West Coast Express. Phase Two plans for expanded capacity in Phase Three of the vision. Public engagement on Phase Two of the 10-Year Vision is now underway until May 11! Visit tenyearvision.translink.ca to learn more and have your say.